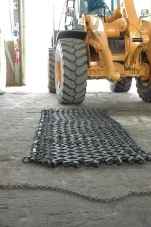 The chain is laid out a flat surface in front of the tyre, with the working area facing downwards. Machine is driven onto chain. 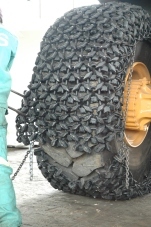 The mounting-chain is attached to the corners of the laid-out chain then hooked over the tyre. 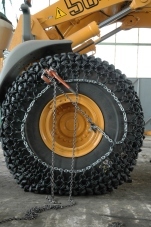 The machine is slowly reversed, thus pulling the protection chain over the wheel until the end come together. 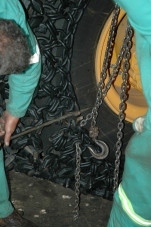 Tension chain is tightened using the rachet lever hoist. 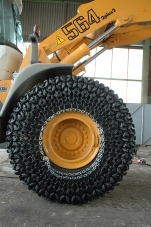 The two ends are joined by means of repair rings. 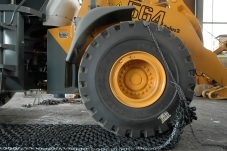 After it is tensioned sufficiently (with a small bag in the forward direction) the end of the tension chain is passed through the guide rings fastened to one of the tension rings, using a shackle. 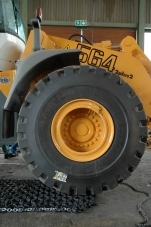 Drive vehicle/machine forward and backward and re-tension if necessary. And voila! 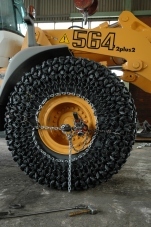 Your tyre protection chain is ready to do the job!